diburning wrote: The head car would stop at the usual spot, while the third car would open the doors letting people step out/off onto the ballast. I understand that that's essentially what they've been doing at BC, but substitute Comm Ave for ballast. I'm sure the autos appreciate that. A dumptruck load of fresh pavement is pretty cheap if the platforms needed to be lengthened here or there. . .I'd say it all depends on how well the 3-car trains improve the capacity on the line. 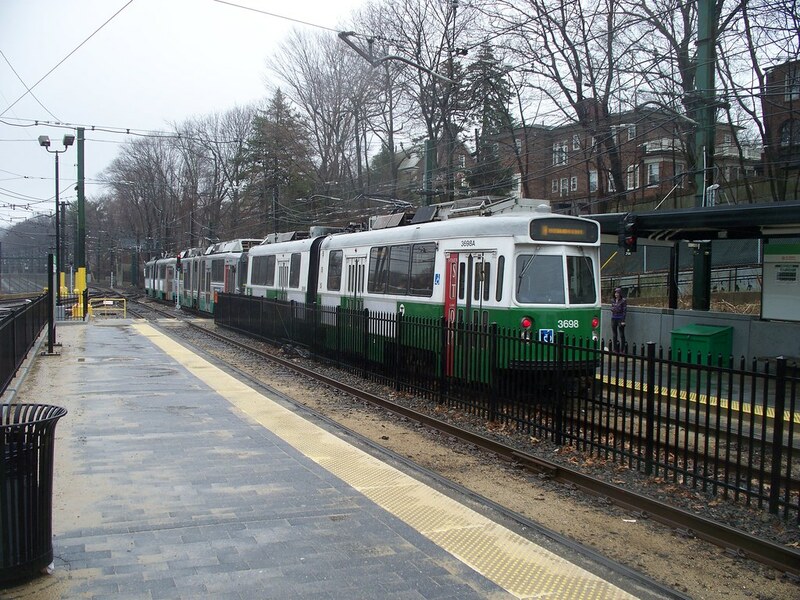 Effective Monday, March 21st, three-car trains will make a total of 32 trips each weekday on the Green Line. In announcing the jump from 13 to 32 trips, MBTA General Manager Richard Davey said the increased service is designed not only to make commuting more comfortable for existing customers but to also have capacity available for new riders. In addition to more than doubling the number of 3-car trains on the Green Line’s B and D branches, the MBTA will introduce 3-car trains to the E branch (Huntington Avenue) for the first time. This also means that 3-car trains will serve Lechmere Station for the first time in at least six years. Last year, for the first time in many years, the MBTA reintroduced 3-car trains to the Green Line…on which 200,000 passenger trips are made each weekday. Anywhere else, yes. But on the T lengthening a surface-level platform would probably cost $1.5 million and take 18 months. In the GM's twitter feed he claims that 3 car trains aren't coming to the C b/c some platforms are too short. I've been racking my head trying to think up which ones though. To me they all seem like they're long enough. Not to mention that any and all E branch 3 car trains will have to be short-turned at Brigham Circle due to the inability to fit them in the Heath Street Loop*. As someone who lives on the street-running section of the line I am none too happy about having to potentially sit-out a trip downtown to wait for a two car, or get kicked off at Brigham Circle. Also, even if the destination signs say E Brigham Circle on the three cars, most of the general public will ignore it and assume it's a full trip. *I'm not sure whether or not a 3 car can fit in the outer loop, but I figure if it could it wouldn't be as ADA complaint as the inner loop. Also, wouldn't short-turning cars at Brigham wreak havoc on the line? Back ups from cars sitting at Longwood waiting to proceed, as well as cars getting stuck on Huntington coming from Heath? Scott10690 wrote: Also, wouldn't short-turning cars at Brigham wreak havoc on the line? Back ups from cars sitting at Longwood waiting to proceed, as well as cars getting stuck on Huntington coming from Heath? Outbound trains switch to the inbound track just before Brigham Circle, so any trains running behind them can continue outbound with minimal delay. You're right about inbounds getting delayed, though. One benefit the green line has is the ability to split and make up trains on the fly (meaning during a trip, not actually while the train is in motion). No reason a train couldn't split at Brigham Circle, run out to Heath St. separately, utilize both loop tracks simultaneously, and pair back up to a 3 car train at Brigham Circle inbound. I doubt they'd ever do this since it's way too "unusual," but it would solve the issues of the loop, and pretty easily too. MBTA3247 wrote: Outbound trains switch to the inbound track just before Brigham Circle, so any trains running behind them can continue outbound with minimal delay. You're right about inbounds getting delayed, though. True, but the cross-back at Brigham Circle is never as easy as 1 2 3. Whether its because a train is already loading on the inbound, or if the switches need to be thrown, it often doesn't go that smoothly. Also if 2-cars are running to Heath Street there's a chance that one of those will be loading at Brigham the same time the three car arrives to cross back. The one positive of turning 3 cars at Brigham that I can think of is that it'll probably cut down on stand-by's at Brigham Circle inbound (for two cars from Heath Street). From what I have gathered they will only be sending two trips in the morning peak and afternoon peak service will be a 3 car train to Brigham circle. Never with the Type8 leading or trailing just sandwiched in the middle? BandM4266 wrote: From what I have gathered they will only be sending two trips in the morning peak and afternoon peak service will be a 3 car train to Brigham circle. ADA. Central access = best coverage. Yeah, it's supposed to be 7-8-7, but I have seen at least 1 rogue 8-8-7 set on the B.
I've seen 3 8s, but this was before all of the 7s were compatible. Plus I think the River was 7s only at that time. 8s are best in the middle because that way the accessible car is never 2 cars away.